News just in from Dirk Johnson at Merle Wood that the price of his central listing, the 37.18m motor yacht Lady Eva, has been reduced. Lady Eva was built by Italy's CRN yard in 1978. Lloyds classed and MCA compliant, she sleeps up to 12 guests in a master, VIP, double and two twin cabins and cruises at 12 knots, with a range of 3,000 nautical miles. This superyacht (ex Lady Madelyn) represents the finest in classic Italian motor yachts. She has a very desirable layout with 5 generous staterooms including a master owners suite and private game room on the main deck. Her panoramic skylounge offers seating for ten with a 60” plasma TV and entertainment center. Her flybridge is configured for alfresco dining as well as comfortable relaxing on reclining steamer chairs. A large covered aft deck provides guests with comfort in all weather conditions. Her well conceived layout and high quality craftsmanship have enabled her to be an extremely successful charter yacht over the years. Lady Eva has just completed a major refit where her steel hull plating was renewed and replaced wherever necessary and her engine room was completely refurbished. 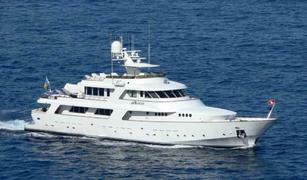 Previously asking $6.9 million, she is now priced at $5.995 million.